Over the past couple months I have become increasingly obsessed with hairpin legs. They make any ordinary table or chair look infinitely cooler and I've been itching to incorporate this mid-century modern look to our decor. Our living room coffee table was definitely in need of an upgrade, so this was the perfect opportunity to give hairpin legs a spin. The bad thing about hairpin leg tables (and the legs themselves) is that they can be a little pricy (at least by our standards). So I made it my mission to make an awesome hairpin leg coffee table without dropping big bucks - spoiler alert - I think we definitely did it. Remember in our office makeover when I shared that our L-shaped desk was made from two Ikea Linnmon tables? Well, Ikea makes those tables in various colors and various sizes. When we picked up the 47" and 59" tables for our desk we also grabbed a 39" table top, which is the PERFECT size for a coffee table. Oh yeah, and IT WAS ONLY $6! There are a bunch of places online to purchase hairpin legs, but my research showed that the average price was around $15 per leg, and the quality was a bit questionable. Eventually I found a set of four 16" legs on Etsy for $50. These legs have a 5 star rating, they're individually handmade, and they come with screws and floor protecting caps - SOLD. I am so happy with the quality of these legs and would highly recommend them to anyone looking to purchase hairpin legs. We have hardwood floors in our apartment so we have to be careful about the legs of our furniture and I love that these legs came with floor caps so we didn't have to find an alternative somewhere else. Once we had all of our supplies, it was time to put together our beautiful new table! The Linnmon table top has pre-drilled holes for the various types of legs Ikea sells, but we needed different holes to fit our hairpin legs. We marked where the holes would need to be for the hairpin legs and then Nick drilled new ones. After that it was easy breezy, we just screwed in the legs, attached the plastic caps, and welcomed the new coffee table to the Surznick living room! What do you guys think? Isn't she a beaut? This table is a few inches deeper than our previous coffee table, which is nice for candles, books, etc. The MCM (mid-century modern, not man crush Monday) look is a much better fit for our living room decor too. 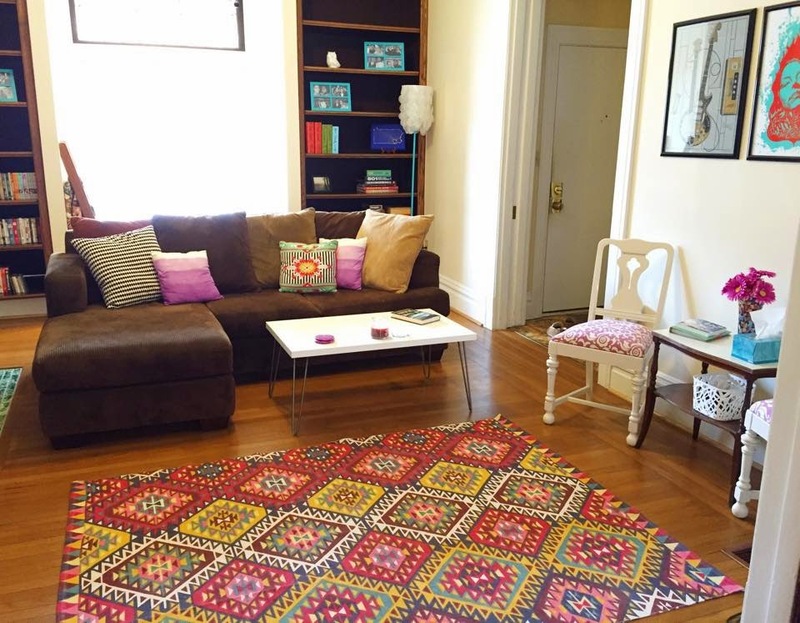 Total cost for our hairpin leg coffee table: about $70 (with tax and shipping and stuff). Not too shabby for a table we absolutely love (there are way less cute coffee tables out there for way more money). If you're curious about what's to come for our old coffee table, stay tuned - we have something fun in store and you know we'll be sharing all the deets with you soon. Have a great week! When Nick and I first started getting into our office makeover, I knew I wanted a pegboard to keep our space clean, pretty, and organized. 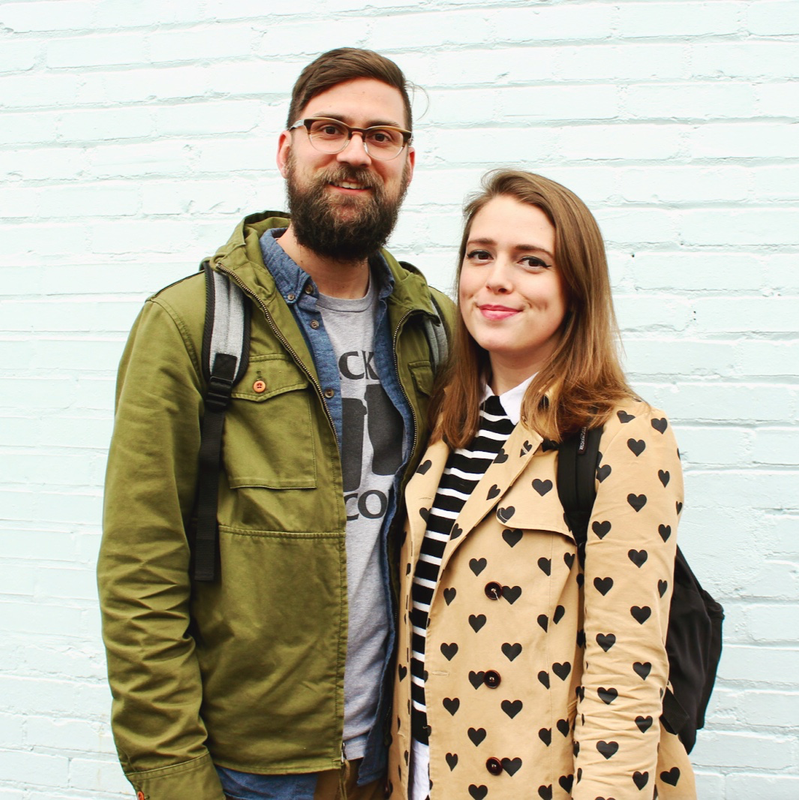 If you looked at the before photos of our office, then you know it was pretty much a disaster. None of my supplies had a designated home, so there were many times where I couldn't find what I needed, or I would make an even bigger mess trying to look for it. I knew having a pegboard would clean up this problem since every item has an assigned spot. Here's how we went from awful to awesome and gave our office a little pegboard chic. Our pegboard is actually two 2x4' pegboards side by side. The pegboards were less money than I expected, at under $10 apiece from Home Depot. I knew I wanted white pegboard, and luckily for us, these were already white on one side so no painting was necessary. When hanging pegboard, you want to make sure that the board is sitting 1/3" or so away from your wall so that the hooks, pegs, etc. can fit behind the board without damaging your wall. To do so, we put 7 washers on our screws to keep the board from the wall. You can also purchase little plastic spacers to go on your screws, but washers were a pretty cheap alternative. We also made sure to use wall anchors when hanging our pegboard, just to be safe and ensure that it can support the weight of supplies on it. Once you're ready to hang a pegboard, we recommend having a partner to help. 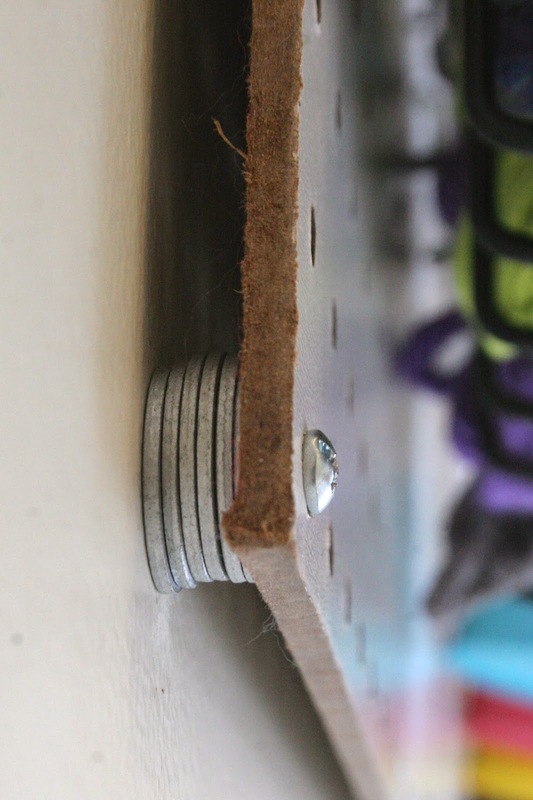 It can be tricky holding the pegboard level while simultaneously not dropping 7 washers, etc., so have a friend nearby! Pegboard storage can be super versatile to fit the needs of your board. When we purchased our pegboard, I wasn't exactly sure what kind of hooks, baskets, etc. I would need, so I decided to buy this 43-piece pegboard organizer kit and a set of three wire baskets. We used almost every single item in the organizer kit, so it was 100% a worthwhile purchase. We're using all three wire baskets too, but the spacing of the pegs on the baskets were kind of wonky and didn't fit our board, so we had to bend and cut them to make them work. Not exactly user friendly. The organizer kit came with basic pegs and hooks that we're using to hold ribbon, twine, glue gun, tape, artwork, etc. They're super multifunctional. The kit also came with various other hooks for things like screwdrivers, pliers, etc. that we instead used for scissors and storing my knitting needles. Nick and I also wanted to add some of our own storage, so we punched a hole in 4 paint-dipped tin cans to hold pencils, markers, and paintbrushes. We also made our own mini shelves out of a pallet board. These ended up being perfect for our various glues and Mod Podges. Overall, if you took everything from our pegboard and gave it a different home elsewhere in our office, it would never be as organized or as easily accessible. Because everything on our board has a designated space, I think it helps to keep me even more organized and put items back where they belong so it doesn't look incomplete. Okay, let me go back to the beginning for a second, because we haven't even talked about the "HELLO!" yet! At 5'4" tall, I can barely reach the top shelf of my kitchen cabinets, let alone grab scissors or something from the top of a pegboard hung above a table. It wasn't practical for me to utilize the top of the pegboard, but I didn't want it to be empty either. The pegboard is the first thing that catches your eye when walking into the office, so a happy, colorful, "HELLO!" was the perfect greeting. We made the "HELLO!" using leftover yarn in a cross stitch pattern and installed the pegboard on the wall once it was complete. I also wanted the pegboard to be full of punches of color. Our office can look so drab (as evidenced by those before photos), so pretty colors would really bring a lot of happiness to the room. We, of course, added the homemade rainbow wheel clock, but we also made sure the pegboard was home to our most colorful craft supplies, like yarn, paint, and thread. As I mentioned above, I didn't want the pegboard to look incomplete, so that was one of my main goals when styling it. I wanted the space to look full, but not overcrowded. I think there's just enough clean, white, negative space without the board looking empty in any areas. The best thing about pegboard is that you can move things around and re-style it as much as you want. I can't guarantee that I'll always want the same supplies on the board, so having the ability to change it around is definitely a selling point. 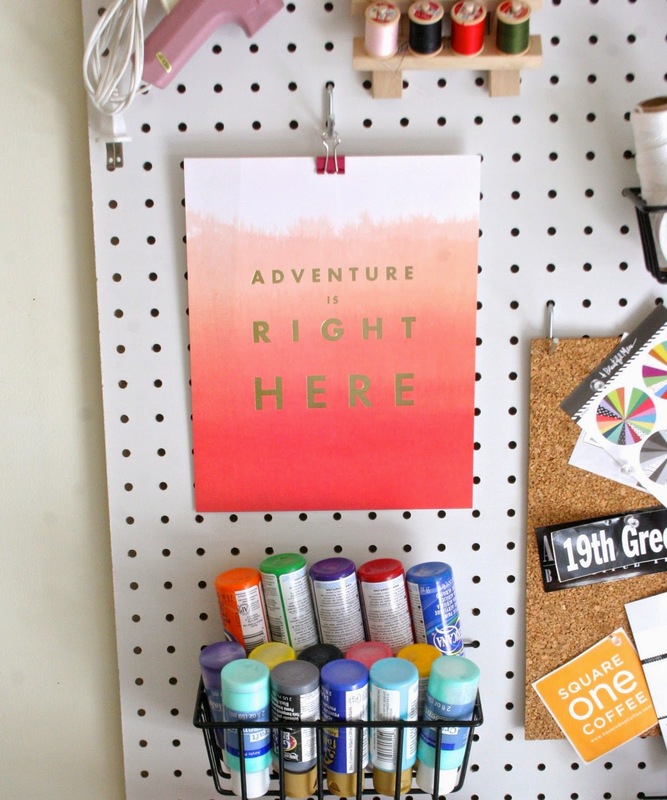 Though the main purpose of the pegboard is to be functional, a little art can't hurt, right? I really wanted to use some space on the pegboard to showcase different art prints. The two on the board came in my A Beautiful Mess Happy Mail subscription. In addition to all of the cards you saw hanging in the office makeover post, Happy Mail also includes fun other items like notepads, stickers, pencils, and the art prints seen here! That stitchable map is my favorite. It's a fun little reminder of all the places Nick and I have been together and the many, many more to see. I really love the "Adventure is Right Here" print too. The dip dyed look is so pretty, and I think it's a pretty good message too. Most of the time spent working in the office is quite an adventure (sometimes a disaster, but those moments are adventurous too). I also added a little cork square on the pegboard for things like stickers, stamps, and photos.